Gold is in the bump phase of a 7-year Bump-and-Run Reversal Top pattern which typically occurs when excessive speculation drives prices up steeply, and is now at a critical juncture which could change the long-term trend of gold. Silver is already in the run phase which does not bode well for its future price. A run phase in which prices break support from the lead-in trend line in a downhill run. The seven-year weekly chart below for gold offers a cautious early view about the long-term trend of gold and is an updated version of my earlier article entitled How Low Can Gold Go on a Correction? Gold has been in the bump phase of the Bump-and-Run Reversal Top pattern since late 2009 after almost three years in the lead-in phase. As can be seen in the chart below the major decline over the past few days has dragged the price of gold sharply below the sell line which suggests the formation of a long-term Bump-and-Run Reversal Top for gold. $1,600 for support from the trend line of last three years (the pink line). $1,400 for support from the warning line. $1,000 for support from the lead-in trend line. Please note that all price targets listed above are just inside the bump phase which is still above the lead-in trend line. 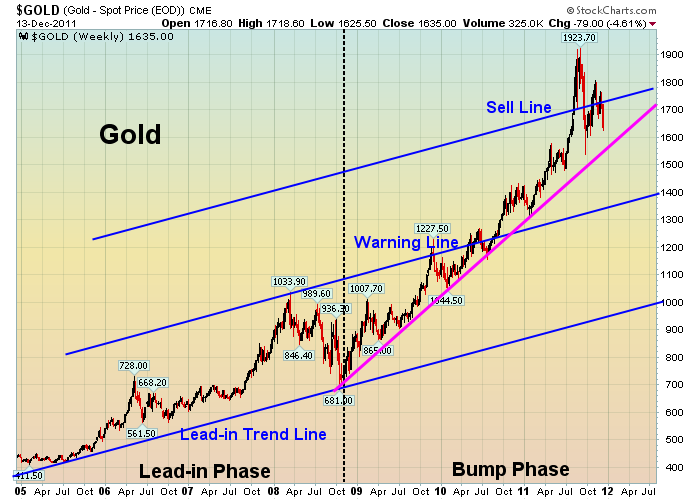 If gold later on completes the bump phase and gets into the run phase which is below the lead-in trend line, what prices could be? This is a mind-blowing question. 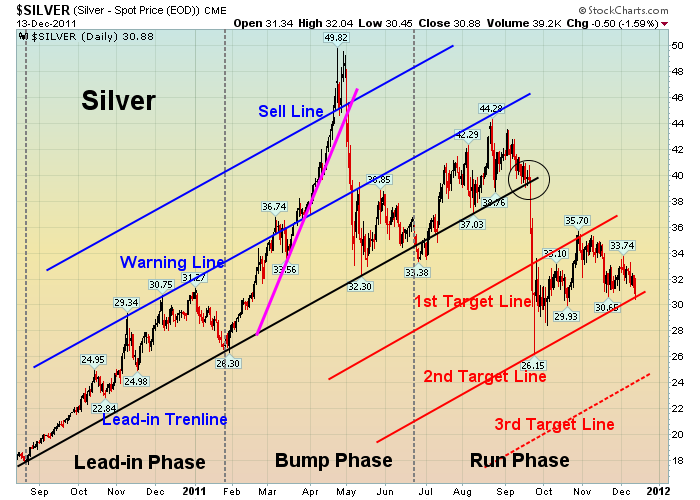 Well, silver is a good example of a downhill run in the run phase. Silver also has a bearish picture with a bump-and-run reversal top pattern in its intermediate-term timeframe. Silver has been in this run phase for some time as I pointed out in my earlier article entitled Why Silver Could Drop Below $30/ozt? $31 for support at the 2nd target line. $24 for support at the 3rd target line. There you have it. As I have said for months now in my previous articles, as supported by my technical analyses as shown by the charts above, the outlook for gold (as low as $1600 and conceivably as low as $1000) and silver (as low as $31 and conceivably as low as $24) look rather bleak in the short-term at least. It should prove to be a very interesting 2012. The time has come to re-check the fundamentals, reality, and risks for gold and silver especially in light of the current bearish performances of all BRIC emerging markets, and the U.S. Fed’s Operation Twist. You can find the history of how these chart patterns developed from my weekly updates listed on the right side manual with dates.